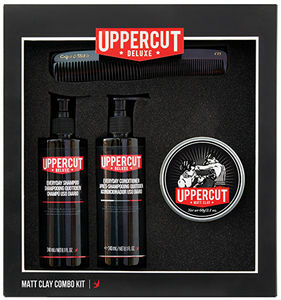 Packaged with a premium look and feel the Uppercut Deluxe Combo kits deliver your favourite styling essentials in a complimentary box. Uppercut Deluxe Shampoo 250ml: Uppercut Deluxe Shampoo gently removes product, while also containing peppermint extract to provide an energising boost as well as nourishing your scalp. Uppercut Deluxe Conditioner 250ml: Designed to work perfectly with Uppercut Deluxe Shampoo, follow up in the shower with this conditioning treatment that will restore your hair to its former glory, restoring body to leave it more manageable. Uppercut Deluxe Black Comb: The Uppercut Black Comb is an easy to use, pocket-sized comb that performs across a range of different hair lengths and hair types. Two different teeth widths makes styling long or short hair easy.